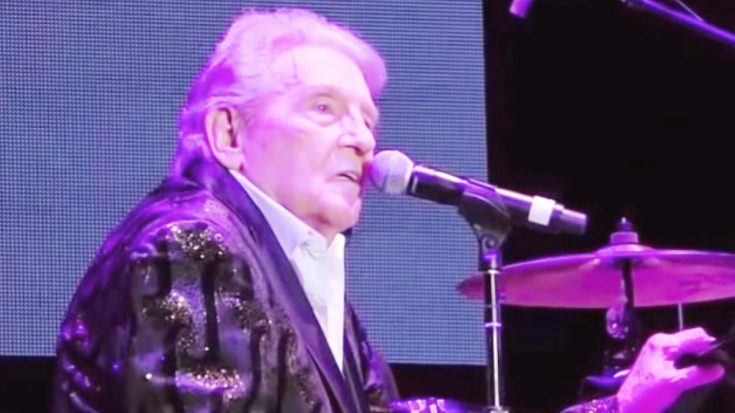 Jerry Lee Lewis may be known as a rock and roll star first and foremost, but he has always been a respected member of the country music community as well. Not only did he share close ties with country stars such as Elvis and Johnny Cash, but he had his own share of country music songs to his name. Now 83 years old, the man that has long been known as “The Killer” has continued to record and perform. He even had concert dates and appearances booked well into this year, but unfortunately had to cancel them following a health scare. On February 28, Lewis suffered what his team described on his official Facebook page as a “minor stroke.” At the time, his team said that doctors seemed hopeful, saying they “expect a full recovery” in Lewis’ case. The team ended their statement by saying how Lewis is looking forward to getting back on the road and in the studio so he can record a gospel album. His Facebook page went silent after that, leaving many concerned fans wondering how “The Killer” was doing following his stroke. After nearly three weeks passed and no update came, those concerns grew even more. Finally, Lewis’ team and neurologist spoke up to share how his recovery is going. Lewis’ publicist, Zach Farnum, spoke to CNN to reveal that the Rock and Roll Hall of Famer has been transferred to a stroke rehabilitation center after spending two weeks in the hospital. His neurologist, Dr. Rohini Bhole, also shared an update on Lewis’ current condition and the outlook for his recovery. Lewis’ team also posted a short statement to his Facebook page, revealing that he would have to cancel a series of upcoming appearances so he can take the time he needs to recover. We’re so glad to hear that Lewis’ recovery seems to be going well. We’ll continue to keep him in our prayers, and hope to see him back on stage and in the studio soon!